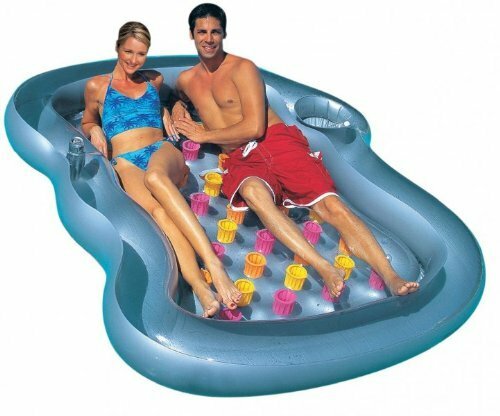 Bestway Inflatable Pool Lounger Includes Cup Holder And Cooling Compartment , selling for brand new. Manufactured by Bestway. There are 1 units left brand new. Our new inflatable lounge mattress with original bestway quality. Now you can relax or/and sunbath on our highly comfortable air lounge. The extra thick air compartments provide the comfort on the floor. Handy storage compartment: now, your drinks are going to stay cold. The pool party can begin! highly resistant vinyl 2 handles repair kit included with storage compartment for your drinks appropriated for young and adult persons trendy design maximal load capacity: 160 kg dimensions approx. (lengthxwidth): 216 x 178 cm / 85 x 70 inches material: pvc color: grey warning: only use under adult supervision. Warning: all air chambers have to be completly inflated.